We’d love your help. Let us know what’s wrong with this preview of Tales From The Darkside #1 by Joe Hill. To ask other readers questions about Tales From The Darkside #1, please sign up. Joe Hill does it again. He has created a new series of stories that fit the comics medium very well. I actually got this from Amazon as a collection of scripts. I wish the show had taken off, but even without that, getting to read this is a joy. Joe's work just gets better as he goes along. This one is a short read, but well worth picking up. The first script is a teaser for what's to come. Loved it! I'm very optimistic about Joe Hill's new comic book series, this was pretty good! First time reading this series. Definitely reminds me a bit of the Twilight Zone. Never watched the TV show, but I guess it was sort of a spin off of TZ. Seems there are only 4 single issues in this series so far. I'll definitely keep this in my subscription, as I am enjoying the stories. TFTD2Growing up, I had always been a fan of Tales From the Darkside. 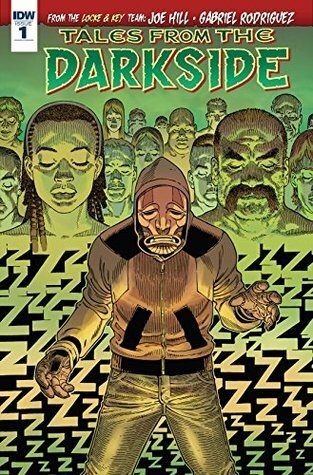 I like anthologies and fantasy/horror/thriller stories and Tales From the Darkside was my gateway into some really creative stories and hardly disappointed me. In May of 2015, writer Joe Hill was set to bring back Tales From the Darkside to TV. I was excited for this to happen, but my excitement was short lived. CW was going to air the series, but then the news came that they had declined to pick it up. Hill approached other networks, but no one optioned to pick up the series. This new comic mini-series is based on the scripts that Hill wrote for the re-launch of the TV show. The first story titled “Sleepwalker” is about a young man named Ziggy. Ziggy has pretty much “sleepwalked” through most of his life. In school, he slept through his final and the only way he could pass was if he helped a fellow student who is a theater major, with her scenes. He becomes quite fond of her but she leaves to study in England, he promises to wait for her to come back. Ziggy becomes a lifeguard, which he considers his dream job, he goes to all the parties, and is loving life. And then a tragic accident happens at the pool he works at and the blame falls on him due to him falling asleep on the lifeguard tower, failing to help. Cleared of all wrong doing, Ziggy finds comfort in seclusion at home. He eventually ventures back out into the world and that is when he is caught in the Darkside event that causes everyone that looks at him to fall asleep. Joe Hill and Gabriel Rodriguez (Locke and Key) unite again to bring us this first issue. Hill, the son of famous horror writer Stephen King, can create one helluva story and he proves it here. My only complaint is that I know he can go deeper with his characters, but with this being a one issue story, he has only so much room to expand on them. The positive is that the story takes off and never loses its pace. And I couldn’t help but wonder how much he had to cut to make this into comic format. I would have LOVED to have seen this played out on television. Rodriguez’s art work is top notch. It gave me a nostalgic feeling, the expressions on the character’s faces, and the close ups really add to the tension of the story, as well as his attention to detail. Ryan Hill’s color complements the art with muted colors and contributes to adding a dark tone to the story. FS: "Someone - maybe the show runner Joshua Friedman - said screenwriters are professional scribblers who dislike being alone even more than they dislike writing." LS: "And we draw away from the slowly revolving cube and the men gathered in terror and awe around it and then... SLAM CUT TO: CREDITS." I liked one of the stories, but overall I was kinda underwhelmed. Joe Hill inherited not only the talent but also some of the style and the approach to building the story from his father (Stephen King). In that sense first issue of Tales From The Darkside is trenched in the unmistakably 80s atmosphere. Hill is romantic above everything else and here he sacrifices the thrills in order to follow the heart - in a likeably naïve way that was present in so many (B) movies of that era (Streets of Fire comes to mind for some reason). If you were into that, this is a Joe Hill inherited not only the talent but also some of the style and the approach to building the story from his father (Stephen King). In that sense first issue of Tales From The Darkside is trenched in the unmistakably 80s atmosphere. Hill is romantic above everything else and here he sacrifices the thrills in order to follow the heart - in a likeably naïve way that was present in so many (B) movies of that era (Streets of Fire comes to mind for some reason). If you were into that, this is a treat. Joe Hill specializes on stories straddling the border between enjoyable and disturbing. There's enough here to read it as a one-shot, but with a thread of a larger scenario hiding in the promise of future issues. Three fun little screenplays. It's too bad the pilot episode never got picked up, for I would've been an avid watcher.